its a little hot and the insides of the soap just open up. We recommend soap that floats on water because that has a lot of air trapped inside. The air is important so that the water vapor molecules will have lots of space to expand once the microwaves get them moving. However, it really sounds like an unscented or lightly scented bar would be best as well. And LOTS of ventilation! We didn’t have any Dove soap around, so we tried it with Irish Spring. It doesn’t come out near as “fluffy”, but it works, although it produces a less than desirable aroma. (Could be the perfume or the dye. I’m not sure which.) My eight year old daughter complained that she couldn’t see the action through the shielding in the door glass, and it was rather hard for me to see, as well, but the result was clearly in line with what we expected. We’ll get a bar of Dove and see if the results are more to her liking. (More fluffy and less bad smell.) Thanks for the great experiments. My kids are in love with the program and every project we’ve done so far. We didn’t have Ivory soap so we used Zest soap, not recommended. Our entire house smells Zestfully “Burnt” Clean. We still loved the experiment though. Thanks! Great idea trying the different soaps! I am guessing some soaps had more water content than others… the puffed ones had more than the melted ones. Color isn’t usually a factor in experiments like this. Enjoy! Hello all the way from London England. 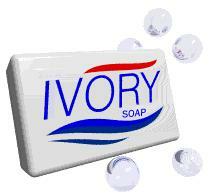 We have done the experiment but because we are from England we could not get Ivory soap. so we decided to base our experiment on which type of soap works the best we used, Dove, Sainsbury Basic and Pears. Sainsburys worked the best it just went in to a big lump of puff it was not as big as Ivory but it was still big and we think we put it in a bit too long but it was still very cool. The Dove was looking good but when we took it out it just deflated and still had the lumpy puffy kind of texture. However, the Pears soap just melted but Pears was seethrough and was not white it was orange. Do you think the colour and the fact that it was seethrough changed the results? what do think Aurora. After the experiment will food cooked in the microwave taste soapy? Thanks for the tip – and yes, the water vapor in the air had time to escape, making it burn. Definitely do this experiment with a new bar… and it sounds like you really learned something! Just telling you, we tried some really old soap and it didn’t work out too well. It started to burn before it blew up into a cloud at all. It should be newer soap so that the experiment will work right! When we got some new soap, it worked the right way. My theory is that the air escaped from the soap over time. Do you think that’s what it might be? Me and my sister used food dye and it looked great! Mine filled up the whole microwave!!! Physical – the water (gas) in the bar of soap is expanding. There’s no chemical reaction going on in side the soap to make it expand. Good question! Is this a physical or chemical change? We wanted to tell you that this experiment worked for us! My daughter measured the final size of the soap- it expanded to 10 inches! They were very excited to complete this experiment! You need a bar of soap that floats in water. It needs to have a good amount of air mixed in side in order for the water vapor molecules to expand. We just finished up our science experiments with Ivory soap. Wow! We had fun! We tried many different variations and even re-wetted the soap, formed it back into a bar and re-heated it. My son was very excited about how much larger it puffed up the second time around. Never had this much fun doing science. Thanks! What web browser (and version) are you using? And are you logged in to the program? I can’t seem to click on any of the student sheets or worksheets on any experiment. Help! I am so sorry you are having trouble! I’ll have my team connect with you right away. Although I was sent an email to access this experiment, the page states that, “Sorry, but it looks like you don`t have access to the rest of this content. Each month, you`ll be given access to the next 1-2 units, so you will probably have access in the future.” Can you please tell me how to access this experiment? Great job observing what worked or didn’t work! 🙂 Keep it up – that’s exactly what a real scientist would do. Let me know how it goes! Our experiment didn’t work as mapped out, but we figured that was because our bars of Ivory soap were found in the depths of a cabinet (ie: old soap). We moved from a humid climate to a very dry climate, and figure that our bars were dried out. The soap did crack and expand a bit in the middle, showing us that whatever moisture was left inside was just that: inside. The rest of the bar looked the same. We actually didn’t mind this outcome, as it gave my 12yo son and I a chance to talk about what might have skewed our result. We will try it again with new bars of soap and report back! You’ll want to look over the notes and comments to see what others have experienced with this experiment. For the soap experiment, it’s usually okay, but the plasma grape experiment has more of a possibility of damaging the microwave. Does it damage the microwave? Can we use the soap in the shower after it has expanded? I am constantly adding new experiments! There are a dozen or so new ones in Lasers (Unit 9), and there’s a new set under “Advanced Physics” for HS students. More coming in e-Camp next week also! Keep an eye out for it!! When are you going to make new videos for new science experiments? I really liked the microwave soap experiment! It was so awesome and I want to do it over and over again! I also liked the airplane one, too. We made a game to throw the airplane and try to get to the end of our sidewalk and whoever does, wins. It’s awesome! I feel great that I get to use this program. I just want to do all the experiments right now! “I thought this was neat because it was puffing up.” 8 year old. Mom perspective: I do suggest trying bowl to contain soap as ours went all over but I forgot to take out the rotating plate. Just had to clean the microwave. It was interesting to see the volume difference when we tried different portions of soap (1 bar, 1/2, 1/4 and 1/8). Will have to weigh and measure the resulting foam. Why do you add to the instructions, not to use a new or expensive microwave? (We just remodeled and got rid of our old microwave that looks like the one you use in the video.) Does it harm the microwave, or is it that the newer microwaves are too strong for the experiment? You are probably right, an older bar of soap will have less water vapor in the air pockets, which is why the bar expands in the microwave. When you get another bar, get more than one… your kids will love it! We tried this today with an older bar of Ivory soap, it was probably a few years old. The soap did not expand the way it did in the video. It kind of cracked into 4 pieces. I am wondering if this could be because the bar of soap was old. We figured out that marshmallows expand in the microwave for much the same reason (although they shrink back down after the microwave shuts off). Is there anything else that we can try to blow up in the microwave? Thanks! we do this when i need to make new laundry soap. it crumbles so much that i don’t need to shred the bar of soap. saves on time and the kids are learning. double bonus for us. We did the Ivory soap experiment … and my kids were so excited they did it again. They didn’t want to waste the soap so we put it in a pretty jar by the bathroom sink. It looks like cotton. We have also made the paper airplanes which turned out great, we keep them in a bag & take them to the park. They are the best ones we have ever made. Thank you! ou can use it just like the pre-microwaved soap… wouldn’t it be fun to stick it in the shower before an unsuspecting grown up got in? hi, can we get this experiment now? thanks! Before microwaving the soap, we put a bar of Ivory and another brand into a sink partially filled with water. We observed the Ivory floating, and the other soap sank. From earlier lessons we realized that Ivory is less dense. Now we know that is because of the high amount of air trapped inside. After microwaving the soap, we repeated the experiment with the other bar for comparison. The more dense soap still had some expansion meaning some trapped water molecules, but not as impressive as the Ivory. The boys loved this experiment. We also microwaved some marshmellows and had them predict what they thought would happen and why. They noticed that the house began to smell like ivory all over and it opened up a great discussion about molecules and diffusion. Thanks again. We have enjoyed science so much! We have been in the midst of a move this month (we moved out of our sold home but our new home isn’t finished being built yet), and science has been like a break to us. I allow the children to choose the experiments and then we just do them. I’ve attached some pictures of the children gathered around the microwave to watch the ivory soap experiment. We actually did this experiment at a friend’s house (since all of our belongings are in storage & we don’t have access to a microwave) and their children were so interested, they joined in our science lesson.Sorry about the picture quality, I took this picture with my phone. I want you to know that these pictures are NOT staged! They were really as excited as they look in the pictures. The video was black during the microwave portion….the most interesting part! That’s awesome!! Use a clear glass bowl, like pyrex, to contain it!! I can probably convince my boys to bathe with this tonight, lol. Sara, the video is also REALLY dark, we could see a couple of seconds of it, but could mainly hear it. The videos are in flash, so you need a regular computer (not a cell phone or iPad) to watch the videos. You’ll want to install a flash player if you don’t already have one installed – search for one on the internet that is compatible with your system. We just signed up for e-science and cannot see/view the videos–just a blank space where the video should be. We have a mac computer so I’m guessing we need a plug-in of some kind? Appreciate any advice! Thanks!